What Should Be In an Estate Plan? You are here: Home / Research Your Legal Issue / Estate Planning / What Should Be In an Estate Plan? Many assume that organizing an estate plan only involves a will or a trust. 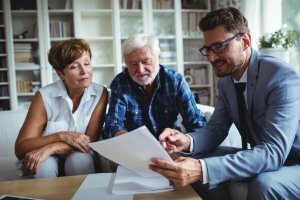 There are many other steps involved in the process of estate planning, however, and many important factors to consider! When creating an estate plan, make these decisions now so your assets are transferred seamlessly. Further, a successful estate plan will include provisions that will allow your appointed family members or other appropriate individuals to control or access your properties and assets, should you be unable to. Estate planning is a complex and lengthy process. As such, it should not be taken lightly. Make sure that your estate plan is fortified in order to help ease the process for your loved ones. By examining the factors mentioned above, you will be making sure that you have not left any decisions unmade. Wills and trusts are included in many estate plans. It is important to have a will or a trust, even if your assets and properties are not grand. Wills, in particular, ensure that your property and assets are allocated according to your wishes. This will only happen if you, and/or your attorney, abide by state and local laws. Some types of trusts will assist in limiting estate taxes as well as other legal challenges. It is important to understand, however, that having a will or a trust is not enough to solidify a strong estate plan. Speak to a qualified legal professional that could assist you in the matter, as the wording of the document(s) is very important! The right language in wills and trusts will help ease the entire process for your loved ones, and prevent any misunderstandings and possible feuds amongst them. In many cases, trusts can help avoid a probate court process. However, if the documents are unclear or unsound, the proceeding and transfer may end up in court after all. Drafting a resilient Power of Attorney is essential in your estate planning. A Power of Attorney will declare the person or agent who you will consider responsible for making any decisions on your behalf for when you are not able to do so. If do not create a Power of Attorney or if your Power of Attorney is not resilient, the courts will be left to decide on the future of your assets and/or properties. This is commonly referred to as a conservatorship. This process can take months at the court and cost thousands of dollars. Having a resilient Power of Attorney will give you an opportunity to have a say on the future of your possessions. There are different types of power of attorneys in each state, and each may function differently. It is important to understand this and create the document that will serve your needs the best. Appointing a beneficiary for your estate is another way to decide the future of your assets when you no longer are able to. If you fail to select a beneficiary or if the person who you have chosen has either passed away or is not able to accept the funds, a court will have to intercept and choose for you. Unfortunately, if you were unable to select a beneficiary, a judge will not likely make the same choices you would have. Most states have a standard line of succession that is followed. It is noteworthy to mention that named beneficiaries are required to be over the age of 21. Often, they are also required to be mentally competent. If you are not sure as to whether or not a person can qualify to be a beneficiary, speak to an estate planning attorney who can help guide you. An experienced attorney will have the knowledge of the local rules and regulations you have to abide by when making a beneficiary appointment. Letters of Intent are not always valid in a court hearing, but they certainly can help a judge know your intentions and can therefore make a decision on the allocation of your assets. This is particularly useful if, for any reason, your drafted will is declared to be invalid. A Letter of Intent is a document written to your beneficiary or your appointed executor. This document helps those interested understand what your wishes are in the event of your incapacitation or your passing. Some of these concerns include your wishes for your funeral preparations or other similar requests. Healthcare Power of Attorney documents designate who will make vital healthcare related decisions on your behalf in the event of your death or incapacity. If you are considering drafting a Power of Attorney, you should consider designating a person you absolutely trust. This person will likely choose and recommend courses of action you would have selected yourself or agreed to. More specifically, this person will be making important decisions about your health and/or end of life. It is equally important to select a secondary person for a Healthcare Power of Attorney in case your primary agent is not able to act for whatever reason. Many wills and trusts already include this clause; however, you should consider making a guardianship appointment if you have not already done so. A guardianship appointment is not particularly important for everyone, but if you have underage children or are planning to have children, selecting a guardian is vital. Selecting the appropriate individual can determine how your children will be raised and cared for. If you have not made a guardianship designation, the court will likely choose for you. In extreme cases, your children could end up becoming wards of the state. In many states, the guardianship appointment does not immediately appoint a guardian. It does, however, provide the court an indication of your wishes when that person initiates the guardianship petition with the court. Estate planning is more than simply deciding how to allocate your assets in the event of your passing or incapacitation. Estate planning solidifies your decisions if done properly. Are you considering drafting your estate plan? First, speak to an estate planning lawyer who can guide you through the process. It is not enough to simply draft an estate plan on your own. You must be sure that your plans are resilient so that your wishes may be carried out how you envisioned them. Contact an estate planning attorney to make sure everything goes according to plan.